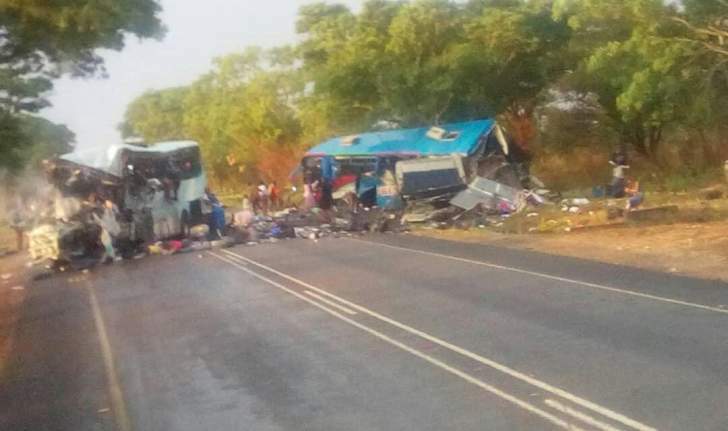 At least 47 people died yesterday evening in an accident involving two buses that occurred at the 166-kilometre peg along the Harare-Mutare Highway. The accident that involved Bolt Cutter and Smart Express buses occurred around 5.30pm. Police spokesperson Assistant Commissioner Paul Nyathi confirmed the accident. By the time of writing, Asst Comm Nyathi said police were still attending the accident scene and the number of deaths might rise. The accident occurred at Torish Farm, about 3km out of Rusape towards Harare. "So far, 47 people have been confirmed dead, 45 adults and two children," said Asst Comm Nyathi. "The accident occurred at the 166km peg on the Harare-Mutare Road - just after the Rusape tollgate drifting towards Harare. "The accident involved a Bolt Cutter bus that was heading towards Mutare which collided with a Smart Express bus which was going to Harare. Police are still attending the accident scene." Makoni district administrator and chairman of the district Civil Protection Unit Mr Darlington Museka said Rusape General Hospital mortuary was overwhelmed and they had engaged Nyaradzo Funeral Services for assistance. District medical officer Dr Tendai Nyafesu said the general hospital mortuary had capacity for 16 bodies but could be stretched to accommodate 36. "This is horrific," said Mr Museka, who was coordinating the transportation of the bodies and the injured to hospital. "It is not something easy to accept and we are very saddened by this sad development in our district. I cannot say much as I am running around following this tragedy." When the news crew arrived at the scene of the accident, the road was blocked and rendered impassable with bodies, the injured and their luggage strewn all over the place. Well wishers could be seen helping ferry the injured to hospital. An eyewitness who attended the accident scene said: "The driver of the Smart Express bus was trying to overtake a haulage truck and encroached into the lane of the oncoming bus, resulting in the head on collision. "The driver and conductor of Smart Bus Express survived and are said to have escaped from the scene soon after the accident." The status of the Bolt Cutter driver could not be ascertained last night. Some passengers were trapped in the bus and could be heard crying for help. The Rusape fire brigade quickly responded and helped remove the trapped passengers. A doctor resident at Rusape General Hospital said at least 70 people had been admitted to the hospital. "People are still coming in, but according to our register now, 70 people have been admitted to the hospital," said the doctor who could not be identified as he is not authorised to speak to the media.